-- In business since 1986, The Best Stop sometimes gets criticism for sliding by on their reputation and some folks say their link is too greasy. However, the recipe, like many across Acadiana, is one passed down from past generations; but not without adjustments and tweaking along the way. At this point, it seems the Best Stop may have tweaked the rice right out of the link. This does not sit well with Cajun boudin purists who seek out a link with the more traditional ratio of equal parts of pork and rice. But, if it is a meaty and fatty link you crave, this one might just fit the bill. 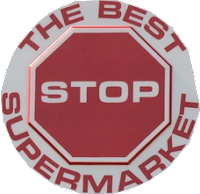 According to their own reports, the Best Stop makes a staggering 10,000 pounds (that's FIVE TONS) of boudin a week. So, if you're looking for a small-time operation, this would not be it. They have a saying that you're "slackin" if you're not eatin' The Best Stop. So, if you don't want to be a slacker - head their way.